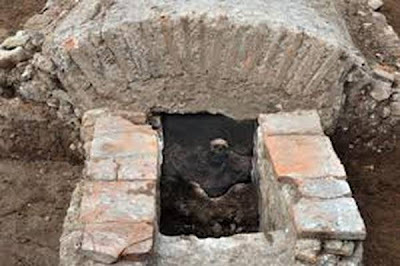 The remains of 31 early Christian tombs have been discovered during archaeological excavations in Nis, Serbia's third largest city in the southern part of the country. 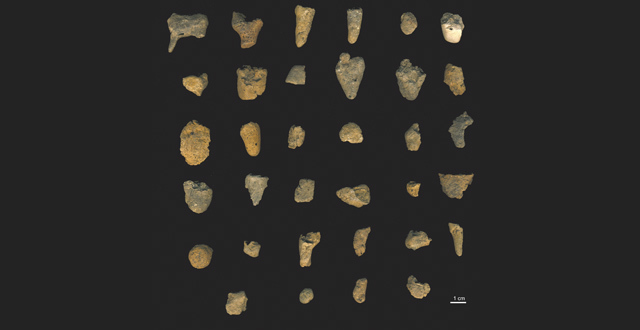 "These are the most important excavations carried out so far on the site of the early Christian necropolis of Jagodin-mala", said Toni Cerskov, who heads the team of 45 archaeologists, architects, anthropologists, photographers and workers at the site. The tombs are located under the former textile factory Niteks, the Tanjug news agency reports. Danish Archaeologists have been busy digging around the old Cathedral in Ribe for several years. Here lies a cemetery, which was abandoned about 1050. 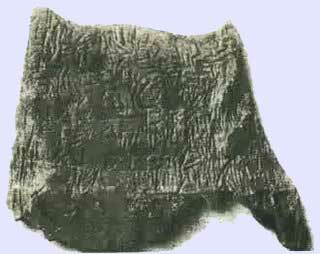 The sensational character of the find has however more to do with the fact, that the earliest graves have been dated to around 850 – more than a 100 years before Denmark was officially Christianised according to the famous rune-stone of Harold Bluetooth in Jellinge. All in all the archaeologists believe there were between 1500 -2000 graves in the cemetery of which at least 60 (and probably 75) belong to the earliest phase. The dead persons have been buried in a number of different types of caskets made of wood, one of which may even have been a small boat. However, the graves are all pointing towards East and no grave-goods have been found. Strontium analysis has shown that the buried persons grew up locally. 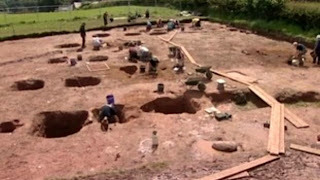 Archaeologists have found something "interesting" and "perplexing" at a Roman dig in Alderney. A team from the island, the UK and Guernsey are excavating land at the fort of the nunnery at Longy Common. The dig is focusing on a gateway and wall but the team said they were "not expecting" the way it was laid out. Dr Jason Monaghan said: "We've found something interesting, but we don't actually know what it is until we take a bit more dirt out." Dr Monaghan, Director of Guernsey Museums, said the team had dug a trench to examine the gateway. "It's a bit perplexing, the nunnery always throws little surprises at us and the wall has changed below the ground level and we weren't expecting that to happen so we need to know why it's changed," he said. "Vikings" are taking to the water to raise money for a south Cumbria museum hoping to house a newly-acquired treasure hoard. A metal detector enthusiast found Viking silver coins and ingots near Stainton, Dalton, in 2010. Barrow Dock Museum raised £50,000 to buy the hoard, and now wants to build a special Viking gallery. Re-enactor warriors are rowing a replica longboat around Derwent Water to raise the cash. 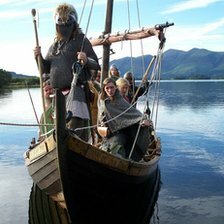 The team, from Herlid Vikings group, will set off from Lodore to the Keswick boat landing, where they will hold a combat display. A recent Heritage Lottery funded archaeological excavation has discovered a hitherto forgotten early medieval royal stronghold in Scotland. Trusty’s Hill, near Gatehouse of Fleet in Dumfries and Galloway, is best known for the Pictish Symbols carved into a natural rock outcrop at the fort’s entrance. However, in recent years, many historians have begun to doubt whether these carvings were genuine, some even suggesting that the carvings are forgeries. The Galloway Picts Excavation, led by the Dumfriesshire and Galloway Natural History and Antiquarian Society and funded in part by the Heritage Lottery Fund, sought to find out why there are Pictish Carvings here, so far from the Pictish heartlands in the north-east of Scotland, and if the carvings are indeed genuine. Under the direction of two members of the Society, over 60 local volunteers, assisted by professional archaeologists from GUARD Archaeology Ltd, spent two weeks discovering new archaeological evidence that establishes a clear archaeological context for the Pictish Symbols at this vitrified fort. It's official ... even ancient folk needed a nit comb. 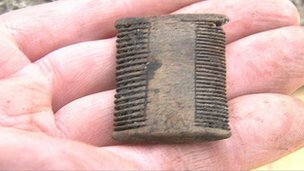 A fine tooth comb is among treasures uncovered at an excavation site near Enniskillen, County Fermanagh. Arrow heads, pottery and ancient human remains have been found at the crannog - a kind of artificial island - that could date back more than 1,000 years. The site is being cleared to allow for a new road, but archaeologists have been given some time to glean all they can before the bulldozers move in. 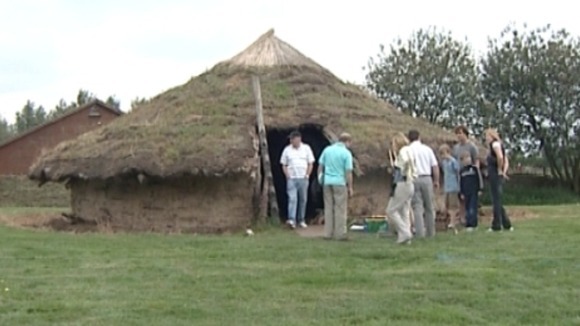 "The Cherrymount link crannog was thought initially to date back to the 14th century but now evidence suggests it went back to early medieval times," said archaeologist Declan Hurl. When excavation work started on Camp Farm adjacent to the Senhouse Museum archaeologists believed they were looking at late Roman buildings. Their recent find of four graves and what appears to be a church shows how life evolved after the fall of the Roman Empire. Site director Tony Wilmott said the find uncovered 'Maryport's missing centuries' and is of national significance. The graves are believed to have been from the 5th or 6th century. 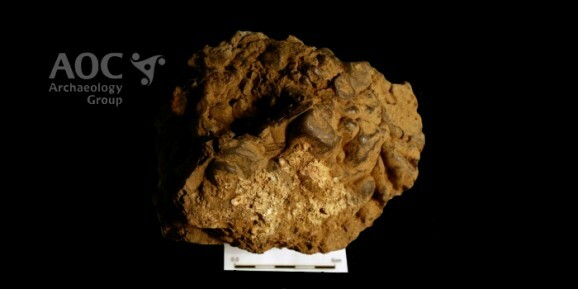 The team to be able use the fragments of teeth and bone found buried to accurately date the site using carbon dating. Concerns have been raised with the Institute for Archaeologists (IfA) and other heritage agencies about the potentially inadequate excavation in advance of the imminent destruction of a crannog site at Drumclay in Fermanagh, Northern Ireland, as part of a road-building scheme. IfA met with archaeologists of the Northern Ireland Environment Agency (NIEA), which has a curatorial role for the site. NIEA explained that the original proposal was for site preservation below the road. However, engineering works elsewhere on the scheme led to a sudden ‘dewatering’ of the bog in which the crannog stood. 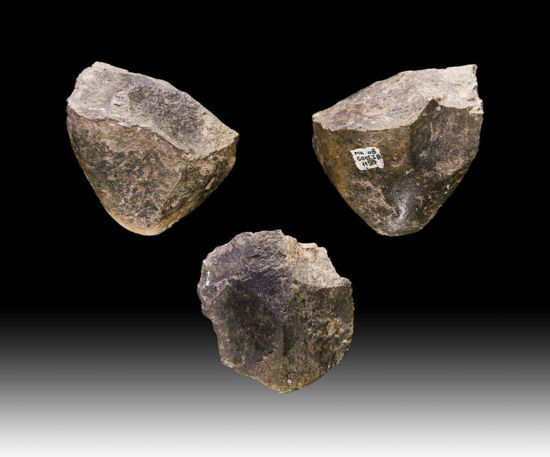 Initially, road stone was imported to support the collapsing crannog but it was over a year later before archaeological excavation actually took place. In view of the crannog’s now extremely fragile state, the decision was taken to excavate rather than to seek to preserve the medieval occupation levels (there also appears to be potential for prehistoric activity). The six-week excavation has now been completed by archaeologists contracted by the Engineering Firm AME and was approved by John O’Keefe (NIEA Archaeologist). However, the NIEA has assured the IfA that no road building work will take place until the Minister for the Environment (Alex Attwood) is satisfied that adequate investigation of the construction levels has taken place – crucially to establish whether the crannog has prehistoric origins. Discussions are underway to ascertain whether these potential earlier remains can be preserved below the road. The Jorvik Viking Centre in York has launched its exhibition Valhalla: Examining Viking Burials in the British Isles, open now until the 5th November. The result of York Archaeological Trust's collaboration with York Minster and Manx National Heritage brings together key Viking burial findings and explores the latest archaeological research techniques. The exhibition will display two Viking-age skeletons from the Hungate excavation in York and a replica of Thorwald's Cross, which is thought to depict the transition of the Viking world of pagan beliefs to the introduction of Christianity. Groups can also discover how excavations reveal the way Vikings commemorated and celebrated their dead using pagan boat burials, grave goods and ornately carved headstones, such as those found in excavations at York Minster. In addition, the story of a Viking man buried in the Balladoole ship burial will be told using forensic science and state-of-the-art facial reconstruction. 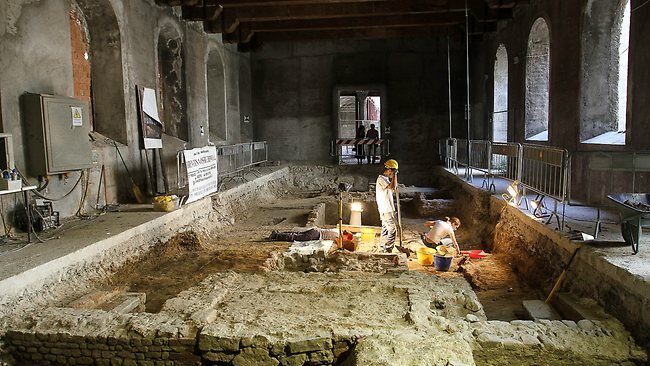 Archaeologists have unearthed a skeleton in a rare state of preservation in Florence. 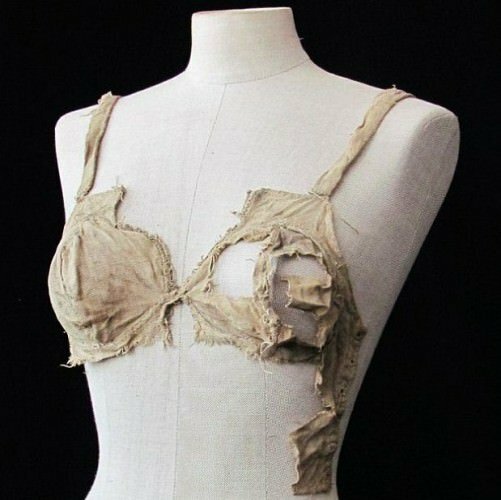 They believe it may be the body of Lisa Gherardini, the Florentine noblewoman widely believed to have served as the muse for Leonardo da Vinci's Mona Lisa. It could be a crucial step towards unravelling the mystery of the woman with the world's most enigmatic smile. Art historian Silvano Vinceti told the BBC: "We are entering the heart of this search, which is the most important moment." An excavation has begun to find the exact location of the Battle of Bannockburn ahead of its 700th anniversary in 2014. Until now historians have only been able to make a rough guess about where Robert Bruce famously led an outnumbered Scots army to victory against Edward II's English force. The battle is one of the most famous in Scottish history, but no archaeological evidence has ever proved exactly where Bannockburn actually took place. Now, a team of local archaeologists has begun an extensive search for proof of where the clash occurred. Historical artefacts revealing how the Vikings celebrated and commemorated their dead have gone on display in York. 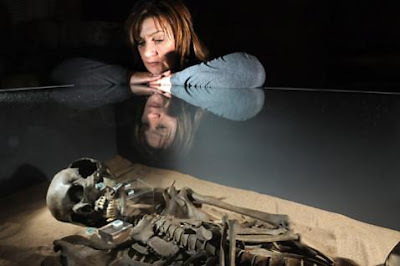 Sarah Maltby, director of attractions at Jorvik with a skeleton at Valhalla [Credit: The Press] The Valhalla exhibition displaying artefacts from excavations in York and the Isle of Man has opened thanks to York Archaeological Trust. The exhibition, which is the result of collaboration with York Minster and Manx National Heritage, brings together burial findings and the latest archaeological research techniques to examine. It includes two Viking-age skeletons from the Hungate excavation in York, which have been the subject of pathological research from York Osteoarchaeology in a bid to uncover more about who they were. Visitors can also see a replica of Thorwald's Cross, which is thought to depict the transition from the Viking's pagan belief system to Christianity. Conservation work has started on an intricately carved Pictish stone from Easter Ross. The Nigg cross-slab dates from the 8th Century AD and features snakes and a depiction of monks receiving bread from a raven sent by God. Nigg Old Trust received grants towards the £180,000 restoration project. The monument has been taken to a workshop in Edinburgh and will eventually be put back on display at 16th Century Nigg Old Church. The cross-slab is one of Scotland's greatest art treasures, according to the trust. 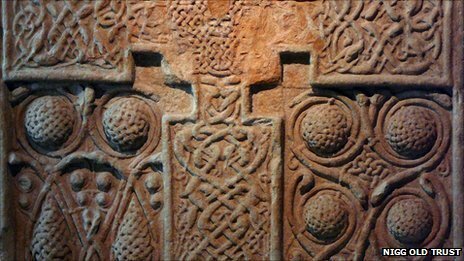 The stone's entry in the Highland Historic Environment database described it as being intricately carved. 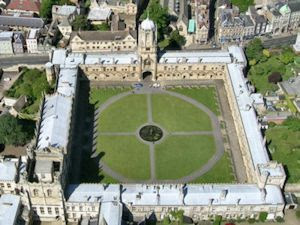 A COLLECTION of archaeological images will be available to the public thanks to the University of York . The Archaeology Slide Collection contains about 5,000 images, many by the founding professor of the university’s department of archaeology, Philip Rahtz, who died last year at the age of 90. Archaeologists in Florence have unearthed a skeleton which they believe may be crucial in the quest to find the remains of the woman who sat for Leonardo da Vinci's Mona Lisa portrait. Several bodies have been discovered in the hunt to find the mortal remains of Lisa Gherardini, the Florentine noblewoman widely believed to have served as Leonardo's muse. Silvano Vinceti, who heads up the team of Italian archaeologists, said this latest discovery in an abandoned convent was particularly exciting - though tests would still have to be carried out to ascertain the identity of the remains. The discovery of a 700-year-old skeleton in Bulgaria—seen at the country's National Museum of History in June—offers evidence that the fear of vampires is far older than Bram Stoker's Dracula. The "vampire" was found entombed among church ruins in the Black Sea town of Sozopol (map) earlier in the month. The skeleton had been stabbed in the chest with an iron rod (upper right), which was in the tomb next to the body. In addition, the skeleton's teeth had been pulled. Scholars believe the rod and tooth-pulling were techniques villagers used to prevent dead men from turning into vampires. The vampire obsession dates back millennia in countries across Europe. A detail from Thorwald's Cross, found on the Isle of Man. Valhalla; it's a word synonymous with the blood curdling, axe-wielding world of the Vikings and their peculiar belief in an afterlife where fallen Norse warriors drank, ate and caroused wildly with their god Odin. Little wonder, then, that the Vikings placed great importance on the funerary arrangements that would transport them to this alluring version of the pagan afterlife. 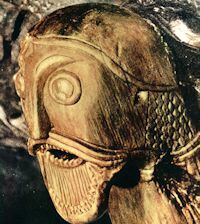 This new exhibition, organised by Manx National Heritage, York Minster and the York Archaeological Trust, lifts the lid on this Viking paradise by looking at Viking burials, artworks, carvings and tapestries from across the British Isles as well as the advanced archaeological techniques employed to unearth and interpret them. From Roman recipes to Victorian victuals, the Museum of London is hosting a series of cookery workshops exploring how our ancestors prepared their favourite dishes. Between September and December, members of the public can learn how to prepare ancient dishes and sample bygone flavours – including ancient Rome’s infamous fish sauce. Led by Sally Grainger and Annie Gray, both celebrated chefs and food historians, the workshops will explore the culinary quirks of four historic periods: Roman, Anglo-Saxon, Georgian, and Victorian. Each class will begin with a short introduction to historic table etiquette and culinary fashions, followed by making forgotten recipes from the period and sampling typical drinks of the era. 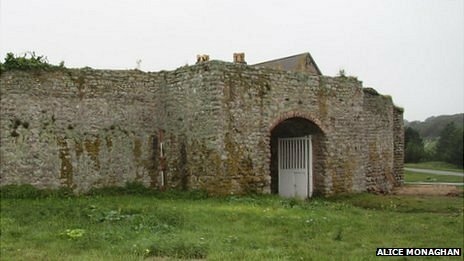 Damage to the south and southwest surrounding walls of Church Island, an important early medieval ecclesiastical site, was unlikely to have been caused by a storm or heavy swell, he concluded. THE race is on to save a rare 15th Century badge that was once worn by a nobleman to demonstrate his loyalty to King Richard III. The silver gilt livery badge in the form of a boar, a symbol of Richard III, was found by a metal detectorist in 2010, near Stillingfleet, North Yorkshire. Now, the Yorkshire Museum in York has launched an appeal to raise the £2,000 needed to buy the badge and ensure it goes on public display. It must raise the cash by September or it could be sold on the private market to the highest bidder. It's the face that launched a thousand imitations. Now, archaeologists are convinced they've found the body of the real Mona Lisa. Buried in a crypt beneath a convent in Florence, Italy, archaeologists believe they have uncovered the skeleton belonging to the model who posed for Leonardo da Vinci's masterpiece in 1504. Lisa Gheradini, whose married name was Giocondo, became a nun after her husband's death. She was buried in the grounds of the Convent of Saint Ursula where she died in 1542, aged 63. Organized in collaboration with the Board of Montréal Museum Directors (BMMD), the AVICOM Committee’s 2012 Conference will be held in Montreal, Canada from October 9–12, 2012 at the Canadian Centre for Architecture (CCA), during the same time as the AVICOM Committee’s annual meeting. The Conference will be followed by the International Audiovisual Festival on Museums and Heritage (FIAMP), a competition that salutes the best achievements of museums worldwide in a number of categories. Visits to various Montreal museums are planned for the final day of the Conference, Friday, October 12, 2012. In addition, a “Guide to Suggested Activities” will be provided to those participants who would like to extend their stay in Montreal through the following weekend. From 200 to 300 AVICOM members are expected to attend. Grave of Mystery Woman in Da Vinci’s Mona Lisa Found? Archaeologists digging at the Saint Ursula convent in the Italian city of Florence have found the skeleton of a woman they claim was Lisa Gherardini, the wife of a silk merchant in the city and the woman who was widely thought to be the subject of the painting Mona Lisa by Leonardo da Vinci. The scientists believe the skeleton matches the skull of an unidentified female, unearthed last year at the same site. However, DNA tests meant to establish the connection between the two have yet to be carried out. It is believed Lisa Gherardini died in 1542 and was buried at a Florentine convent. "We don't know yet if the bones belong to one single skeleton or more than one. But this confirms our hypothesis that in St Ursula convent there are still human bones and we cannot exclude that among them there are bones belonging to Lisa Gherardini," archaeologist-in-charge Silvano Vinceti, who has worked on the Mona Lisa mystery for some time now, was quoted as saying in the Daily Mail. 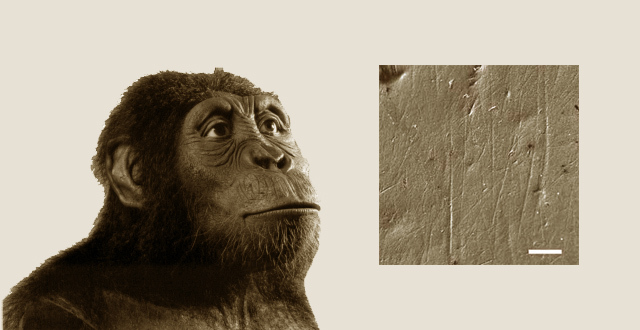 Incidentally, last year Vinceti claimed he found da Vinci's initials - LV - in the eyes of the woman in the painting. Golden medallions featuring inscriptions and images found in a gravesite dating to the Roman era in Debelt, a village in the region of Bourgas on Bulgaria’s Black Sea coast, have been identified by archaeologists as being from the second century CE. 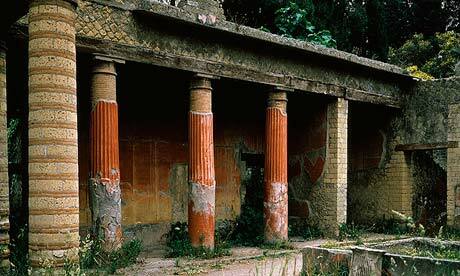 According to archaeologists, the graves are those of veterans of the eighth legion of Augustus. They are in the western part of the ancient Roman colony of Deultum, according to a report on July 17 2012 by public broadcaster Bulgarian National Television. Today the gravesite is next to a street in the latter-day village of Debelt. Deultum, in its time, was known as “Little Rome in Thrace”, the report said. The find was made by accident while people were pouring concrete for construction. The vibration of the concrete mixer caused the surface to crack and a tomb was found. In 2001 a local landlord invited the Stewartry Archaeology Trust to investigate a stone circle where legend told that the Devil had been seen dancing. When they arrived, archaeologists quickly found that the ‘monument’ was in fact a series of capstones covering a Neolithic passage grave and Early Bronze Age cremation burials. To date 62 prehistoric cremations have been found on the site, partly overlain by Medieval buildings. The Council for British Archaeology has been working in collaboration with ITV, the British Museum and the Portable Antiquities Scheme on Britain’s Secret Treasures to ensure that everyone fully understands all the issues involved in the search for “treasure” and can seek expert advice and guidance. So, if you are thinking of rushing out to buy a metal detector to search an area near you and seek out your very own “treasure”, CBA Director Mike Heyworth explains why you should think again.